Obituary for Maxine "Mac" (Coleman) Gregg | TRAUB FUNERAL HOME INC.
Maxine Gregg (Coleman), 93, of Brewerton, NY passed away peacefully in Phoenix, AZ, after suffering from a long illness. Born in Constantia, NY, she eventually moved to Brewerton, NY, living there with her late husband for about 40 years. 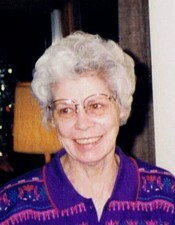 Maxine retired from The North Syracuse Central School District in 1984. She had a deep love for gardening and ceramics. She proudly owned several generations of miniature poodles throughout her lifetime. Born on August 1, 1924, Maxine was a devoted wife of 57 years. She is predeceased by her husband, Herbert, her parents, Ford and Helen Coleman; brother, Ford; sister, Betty and sister, Donna. She is survived by her brother, Carl Coleman; and nieces and nephews. A grave side service will be held on September 5, 2018 at 11:00AM at Hillside Cemetery in Central Square, NY for friends and family.